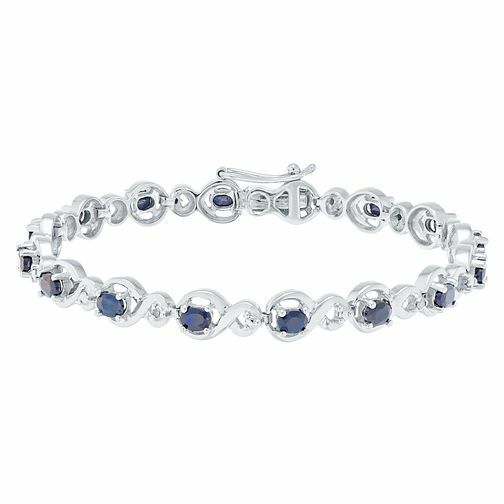 Indulge her love of classic elegance and sparkle, with this sumptuous sapphire and sparkling diamond bracelet. Elegantly crafted in smooth sterling silver for a fresh feel she'll adore. Sterling Silver Sapphire & Diamond Bracelet is rated 4.2 out of 5 by 5. Rated 5 out of 5 by Anonymous from Very happy with bracelet I bought this as a wedding present for my wife. I thought it was a good idea for something blue. She really liked it. It is very dark blue though. Looks more black.